The Evaluation Kit epc901 is a fully assembled and tested system for the evaluation of the the epc901 line imager. 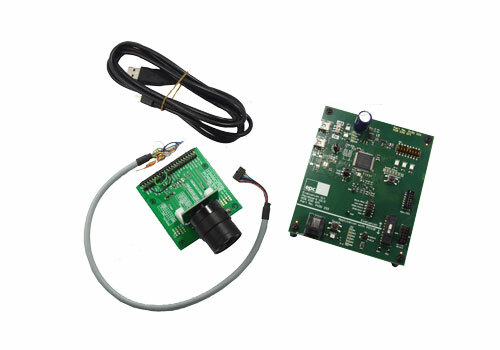 The Evaluation Kit consists of an epc901 camera module, a mainboard, cables and software. The “Evaluation” main section is equipped with a STM32 ARM Cortex micro controller. This section provides a powerful and flexible development environment for the design engineer. It supports all the epc901 line imager camera module. The camera module comes equipped with an epc901 line imager chip. The module includes a complete lens system and a camera cable connects it to the mainboard, allowing a flexible and convenient placement in a lab setup.